This post is also available in: Dutch, Papiamentu. A young Kadushi plant, tucked away lovingly between the protecting rocks. A Kadushi (Cereus repandus) seedling has been lovingly surrounded by pieces of limestone rock, in an attempt to create some shade, and circumstances for moisture collection in the burning sun and scorching heat of Klein Bonaire. 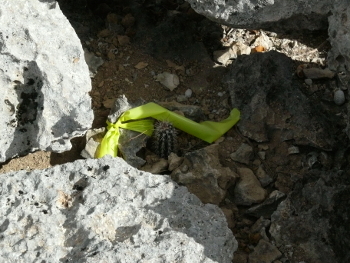 The small plant has been transplanted from another spot on the mainland, where this species grows in abundance, to the new location on Klein Bonaire where it will be one of the founders of a new population of cacti. 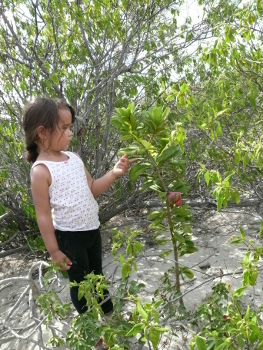 The small plant is part of a reforestation project aimed at bringing back the once diverse native vegetation and consequently the diversity of native fauna back on Klein Bonaire. In this nature recovery project by local NGO Stinapa Bonaire, rare native trees and plants are planted on the small island with the ultimate goal to establish stable and viable populations, which in their turn will also attract fauna such as butterflies and birds to the small island. Map with an indication of the current reforestation project. Until about 40 years ago, large amounts of goats resided on the small island just off the south coast of Bonaire, feeding on the already deteriorated vegetation, caused by deforestation. Those goats are no longer there and the island is now popular as a recreational area, due to its long powdery white sandy beaches, and as a conservation area, for nesting sea turtles, several species of migratory birds and other elements of Bonaire’s nature. The core reforestation activities started in the year 2006 when biologist Dolfi Debrot, put the first rare and carefully cultivated native plants into the ground. This trip was followed by planting expeditions in 2008 and in 2010. Hundreds of individuals of rare plant species were brought and trusted to the small island. In October 2013 the Caribbean Footprint team payed the island of Klein Bonaire a visit, to see how the project was going and how much work was being done on the site. The reforestation efforts are still going strong even now, at the beginning of April 2014. Since May 2013 up to the end of October 2013, 220 young plants had been been planted on the island. 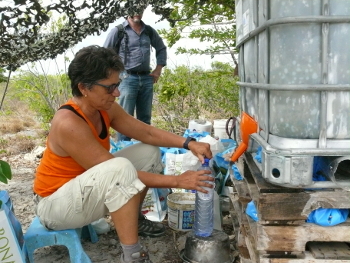 Elsmarie Beukenboom illustrates the water management system ton Klein Bonaire. shade of larger trees. Plants are now planted in the middle of the wide landscape and watered regularly. 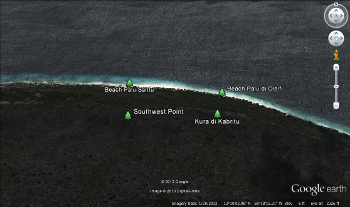 This is done using a carefully planned out water management system, from a ‘basecamp’ that is located close to the coast of the island. Under a camouflage net lies a collection of bags containing reused plastic bottles, a large water tank, which is filled regularly with water from the mainland, different hats and small benches. The bottles are filled with water one by one and every little plant gets a full bottle regularly, awaiting the rain season, providing the plants with a much needed head start until the rainy season starts. Together with Elsmarie Beukenboom from Stinapa Bonaire we went to Klein Bonaire to take a look at the collection of plants, which had been planted over the years. The enthusiasm was great when we saw the first mini leaf on a small cutting of a Sia Blanku (Bursera karsteniana), stuck in the ground in one of the holes dug by the Coastguard. And even this mini leaf sported a small bite-mark of an unknown assailant. It could have been a lizard, iguana’s are unlikely because Elsmarie has not spotted any iguanas on this part of the island yet, or maybe a crab. A tiny bite taken from the new leaf. The crabs of Klein Bonaire don’t seem to be too fond of the reforestation project. One of the tiny Kadushi plants, which was planted a few days before our visit, was now lying about 40 centimetres away from its original location at the time of our visit. Elsmarie tells me this isn’t the first time this has happened, and she suspects that the crabs aren’t too fond of these new, strange plants in their territory. With brute force the young plants are pulled out of the ground and dumped a little further. It is a continuous and delicate search for the spots where the crabs allow the plants to be planted. A couple of months after our visit to Klein Bonaire we received some pictures from Elsmarie of the island after a much needed rain shower, showing hundreds or maybe even thousands of crabs hurdled together as if holding a meeting. Yalena next to the Mata Piska tree from 2010. The reforestation project doesn’t only provide for difficult moments though, which is illustrated by 3 minor but indeed important observations: the success of a Mata Piska (Jacquinia arborea), planted in 2010 en grown extensively in the past 3 years; the population of very rare Kalabarí trees (Zanthoxylum flavum) which were producing a large number of seeds at that moment; and the fruits on the Watakeli tree (Bourreria succulenta) which was planted by Debrot in 2006. “The production of flowers and seeds provide a larger living area for several species of insects and birds”, Elsmarie tells me proudly, looking frowningly at a young man carrying a water gun who runs trough the delicate area in which new plants were planted recently. The Kalabarí is a species of tree which was extensively cut down in colonial times for the production of wood. It is a very rare tree to Bonaire and even rarer on the island of Curacao, where the tree was also extensively harvested. 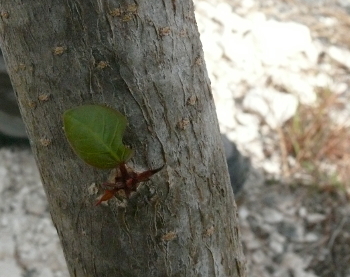 It is safe to conclude that the seeds from the seed bearing trees on Klein Bonaire tree were carefully harvested by Elsmarie so they can be sawed and raised into new seedlings which in their turn will be used for the safeguarding of the species on Bonaire and Klein Bonaire. 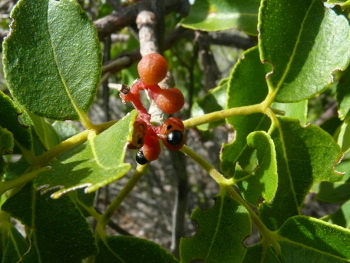 The fruit and seeds from the Kalabarí. The success stories of the reforestation on Klein Bonaire are an example for the entire Caribbean region and show that with care, love and especially patience, people can lend nature, which is under severe pressure, a valuable helping hand. Wat een leuk project. Past helemaal in mijn idee van landschaprestauratie.